I can see Begin Again being big during the NA golden years a while back. It had the key elements: young people going to college and making dubious choices, lots of drama, bad boy hero and a nice girl heroine. Unfortunately, it doesn’t work for me now. I’m not saying I’m over New Adult. I’m not. 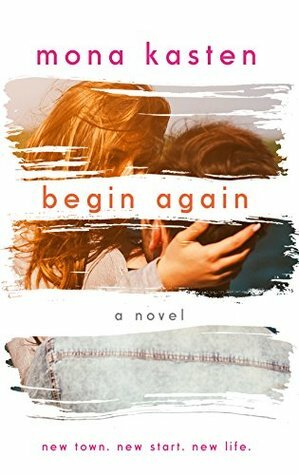 I read two NA books this week alone that I absolutely loved, but they didn’t feel as stilted as Begin Again. I understand this book was initially written in German, so I’m blaming the stilted and sometimes uncomfortable dialogue on translation problems, but I don’t think I can blame translation for the rest of the issues I had with this book. First, I didn’t dislike Ally, but I didn’t like her, either. She lacked the backbone needed to make me connect with her. Spineless main characters are one of my biggest pet peeves, and the way Ally let her family and Kaden walk all over her didn’t work for me. Kaden…Well, Kaden, I’m all in for alpha males, but you took things a little too far, huh, buddy? Kaden is a jerk. There’s no nice way to say it. To his credit, he admits to being one. To my credit, his reason to being a jerk didn’t convince me. Kaden’s trauma wasn’t big enough to justify his actions, especially one toward the ending—the break up scene. What he did was cruel, unnecessary and I was Scott (Ally’s friend and the most sensible person in this story) the entire time after Ally confessed what Kaden did to her. Scott is the best part of this story. His constant “Sorry, people, but that doesn’t work for me” comments about Kaden’s behaviors gave me life. I felt represented by Scott throughout this story, because he wouldn’t go all “aww, cute” whenever Kaden showed up after screwing up. He’d try to make Ally see some sense, though that seemed to be a lost battle. I did enjoy some of the moments between Kaden and Ally mid-book, because I thought he was progressing toward opening up to her and being less rude for no apparent reason. But then he’d do something stupid and I’d take that step back. Maybe if Ally had been more sure of herself and stood up for what she wanted, I could’ve enjoyed this book. But with Kaden being a jerk and Ally lacking a backbone, plus the problems with the dialogue, this book was a lost battle for me.